Milli Muslim League, a politico-religious party linked with JuD leader Hafiz Saeed, has decided to support the Allah-o-Akbar Tehreek in the elections. AAT, a little known political party led by Dr Ahsan Abdul Bari, was formed some 15 years ago and was registered in the Election Commission of Pakistan in 2013. Saifullah Khalid, the MML president, told his workers in a Friday sermon to get ready for the election. “Success in the 2018 election will be your fate,” he said. He said the MML will enter into an electoral alliance with other parties after Eid. Tabish Qayyum, a spokesman for the MML, has confirmed that his party will be supporting the candidates of Allah-o-Akbar Tehreek. The Election Commission of Pakistan has declined to register the MML as a political party after the opposition from the PML-N government. The matter is in court. In a letter to ECP in September last year, the interior ministry said the ‘recent political activities of MML have been officially objected to at the diplomatic level’. The interior ministry’s letter was based on fears expressed by an intelligence agency that the ‘indulgence of proscribed and under-observation organization in the political process with an aim to win legitimacy is a serious issue and registration of such group as political party would breed violence and extremism in the politics’. Mr. Saeed had also shown interest in entering mainstream politics in a meeting with a group of journalists in December last year. However, the MML spokesperson denied having any knowledge of Mr. Saeed’s decision to contest the elections. Dr Mian Ahsan Bari, the leader of AAT, in a telephonic conversation told SAMAA Digital that MML has announced their support for his party and it is not an electoral alliance. He said the AAT will contest elections from Sindh, Punjab and Khyber Pakhtunkhwa on provincial and national assembly seats. On April 3, the US Department of State amended its designation of LeT, identifying the MML and Tehreek-i-Azadi-i-Kashmir as LeT affiliates. The US treasury department also named seven members of the MML as LeT activists. “In August 2017, LeT chief Hafiz Saeed created the MML to serve as a political front for the group. 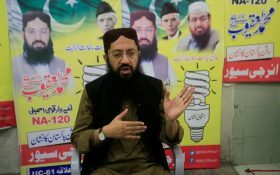 LeT members make up MML’s leadership and the so-called party openly displays Saeed’s likeness in its election banners and literature,” the State Department said. In off-the-record conversations, the PML-N leaders have opposed Hafiz Saeed’s entry into mainstream politics. They believe that the entry of MML and other religious parties into politics is an attempt to dent the vote bank of Sharif’s political party.